I know it’s been quite a while since I’ve posted anything here – a few longtime readers have even asked if everything’s okay, which I greatly appreciate. There’s also an odd thing with blogging where once you lose your momentum and it’s been some time since you’ve posted, you start to feel like the next post you write has to be a-m-a-z-i-n-g. The pressure to write Something Great becomes rather intimidating, and then, well, it’s kind of a self-fulfilling spiral. All of that, and, quite frankly, I get a little worn out each year after October Unprocessed. But then something happens – even if it’s a tiny but impactful moment – and it kicks me in the pants and gets me to log back in and start writing again. Last weekend I attended the Natural Products Expo West show in Anaheim, California. This is the tradeshow for the natural products (mostly food) industry. There are about 5,000 exhibitors, and it fills every square inch of the convention center. Six huge expo halls, the adjacent stadium, the lobby… it’s simply busting at the seams. This was my third year attending — it took three days and I barely scratched the surface. I went for two main reasons: First, to scope out new and interesting trends in the natural and health-food world (keep an eye out for Baobob and Mulberries coming soon). Second, to seek out fantastic advertisers for Healthy Ads. I walked the show floor with Suzanne Elizondo, my campaign manager. (You’ll remember her from our October Unprocessed hangouts and the October Unprocessed Facebook Group — she’s also helping with Healthy Ads.) On Saturday, we spent most of our time going up and down every aisle in Hall E: The Basement. We spent the day walking in the concrete bunker, in artificial light, past booth after booth of “vitality” drinks, energy bars, and popped chips. You see, most of the vendors at Expo West wouldn’t fall into the category of what I call “healthful” — or even “natural” — but alas, that’s the way it seems to go. So our job was to find the companies that make products that truly promote health. I’d say about ten percent of the companies there actually fit into that category. The good news is that ten percent of 5,000 companies is still a lot of good apples. At the end of the day, we were beat. As we made our way up that last aisle, we came upon one shiny beacon. In the very last row, against the back wall, right in the middle, was Grower Pete’s. As we approached their booth, something fascinating happened. Suzanne and I both felt a powerful, tangible shift in our bodies. Something changed within us, physiologically. It was at once weird, surprising, and invigorating. We were drawn to the booth – I simply had to spend a few minutes there. In a sea of products we had actually found produce. We spent a few minutes talking with Vince, whose energy was almost as radiant as the lettuce. As you can imagine, I started chatting him up enthusiastically about Healthy Ads — what a great fit for our network! He told me about how they sell living butter lettuce and watercress. When you buy their greens, the roots are still attached. You even have to wash of some of the dirt. It truly doesn’t get any fresher than that unless you grow it yourself. As we headed home that evening, it took a few hours for what had happened to sink in. As you’ve probably noticed, I’m really not a super-spiritual guy, and tend to favor science and numbers over touchy-feeley, self-helpey stuff. But my body said otherwise. It reacted, physically, tangibly, to the life-force of these greens. This took “listen to your body” to a whole new level for me. Next time I go to the grocery store, you can bet I’ll be looking for Grower Pete’s Organic, living lettuce. Have you ever experienced something like this? Chime in below and share your story! I’m glad to hear that things are well with you, Andrew. Healthy Ads seems like a very exciting project! 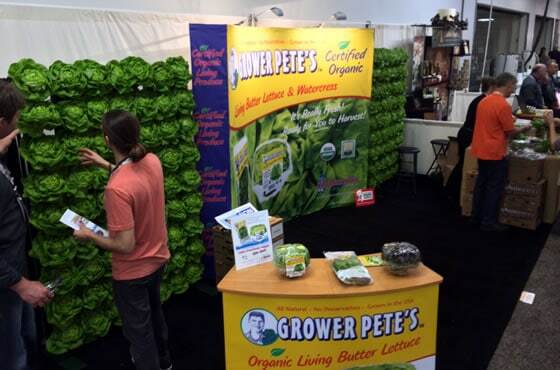 I can’t wait to see Grower Pete’s butter lettuce and watercress at the stores soon. By the way, I was trying to go unprocessed for Lent. It seems a bit challenging this time for some reason, but I’m taking it day by day :). I completely understand the feeling. For me, it is the difference between a treadmill workout and walking in the mountains with breathtaking views of the ocean. All of the senses are engaged and invigorated. Or . . . if you put any credence in the psychology of color: “The color green is the color of balance and harmony. From a color psychology perspective, it is the great balancer of the heart and the emotions, creating equilibrium between the head and the heart.” The psychology of color is the reason why padded cells are often Pepto Bismol pink. Great reading you again. Cheers! I enjoy hearing from you when you have something to blog about/post rather than getting my inbox filled with posts just for the sake of it and its such great timing for me. I have had a couple of weeks of eating poorly with lots of processed foods. I was laying in bed this morning thinking that I felt slowed down by it physically, my weight is creeping up again and I need to make some changes to get off this particular wheel again. I get up, check my emails and find the link to this blog. 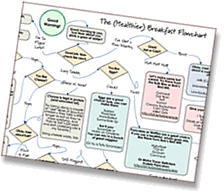 Magic motivation to start over with unprocessed eating to get back on track – no waiting until October. So thanks for the post. P.S. 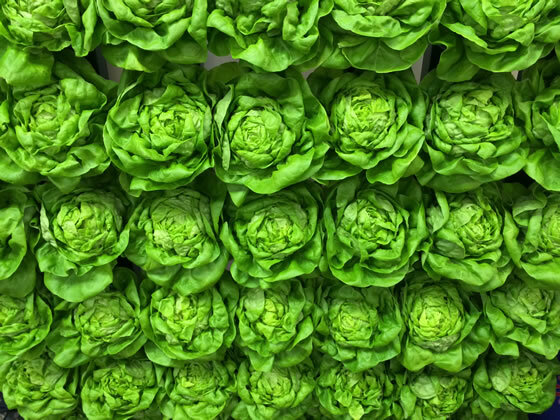 I really want one of those lettuces in the picture. Andrew! I’m so glad you’re feeling better about the blogging and so glad you’re back! You don’t have to Be Amazing… What you offer IS amazing. I think I’ve had the type of experience you described at the farmers market, in the produce section of Whole Foods and at the yoga studio. I want more, so I return again and again. Thanks for the energy you put into finding and sharing the best experiences.